If you've been paying attention to political video these past few weeks, you know that Senator McCain's YouTube channel has officially gone viral. A series of attack ads that mock Senator Obama's celebrity status have drawn millions of views on YouTube and likely several times more eyeballs on television, as the news networks have been amplifying each new provocative clip. The ads have drawn criticism and praise from the mainstream media, including the accusation that "The One" is a not-so-subtle insinuation that Barack Obama is the anti-christ. One thing is certain - the videos are getting viewed. But back to McCain. We've been waiting for his YouTube channel to take off... up till now, most of his content lingered around a couple of thousand views, while Obama's YouTube machine churns out 2-3 videos a day that draw tens and often hundreds of thousands of views each. 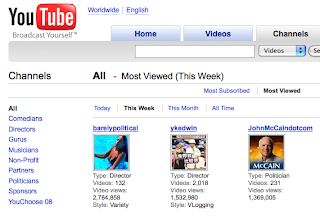 That Obama has beaten McCain on YouTube so far isn't surprising. His resonance with a younger demographic, his consistent uploading pattern (at around 3 videos a day the campaign is essentially producing an internal documentary archive of their candidate), and his Internet outreach strategy have fueled a YouTube channel that boasts over six times as many subscribers as McCain's. But the ironic thing here is that John McCain is a candidate made for YouTube. His infamous "Straight Talk Express" has always been about giving direct answers to important questions... of engaging with people and not backing down from difficult issues. McCain likes to call himself a maverick and has earned that reputation in Washington.... and it's that sort of candor and independence that is almost perfectly tailored to YouTube. Indeed, McCain's strengths as a candidate are arguably more advantageous to a YouTube world than Obama's: the YouTube community values authenticity (a loaded word) or at least perceived authenticity far more than slick phrases or well-put together speeches, for which Obama (fairly or not) has been criticized. Yet, McCain has not taken advantage of his straight-talking image on YouTube. Most of his videos are clips pulled from TV or heavily produced web ads. He should be uploading direct-to-camera videos from the campaign trail every day - telling voters around the country how the campaign is going and what he's focusing on, taking questions from people via video when he can. This isn't rocket science and doesn't require production time or a high-tech editing suite to produce... the campaign just needs to have a video camera in the back pocket of McCain's personal assistant wherever the Senator goes. They could shoot the videos on the fly. McCain would do well to take some queues from his daughter, Megan. Her YouTube channel - McCain blogette - is a great glimpse into life on the campaign trail through the unfiltered (mostly) eyes of a 23 year old kid. She's been posting direct-to-camera videos talking about the primary season, behind-the-scenes footage from the Senator's biography tour, and even personal family stories. Each of these videos give you a personal view of her life and of modern day politics in an Internet age. The videos connect you with her on a personal level... something YouTube is built to do. Megan's father should do more of the same... by all accounts he's got a great personality - I can vouch for that in at least the one time I've spoken with him - during a visit to Google in which we had the chance to interview him. McCain was engaging, humorous, and self-deprecating as he fielded questions from YouTubers in this short Citizentube video. That McCain's YouTube channel took off this week on the rising tide of negative political advertisements isn't surprising - negative ads have always drawn attention in American politics. But now that he has this new audience, Senator McCain should seize the opportunity and use YouTube to connect with people in the genuine, straight-talking manner he's so well-known for. It would be a hit on YouTube.